Is your kitchen beginning to feel like a blast from the past? Not only does an outdated kitchen feel dull and uninviting, it can make your entire home feel tired and worn. It can also lead to can lead to inefficient meal prep, high energy bills, and challenges selling your house. 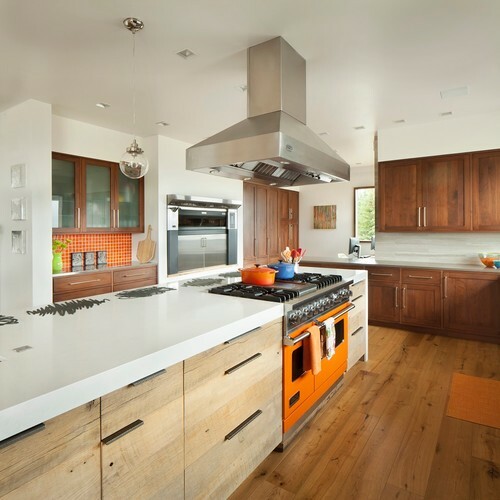 But whether you are trying to sell your home, or you plan on staying in your space for decades to come, there are a number of things you can do to bring your kitchen into the present. Here are some ways to make your outdated kitchen feel new and inviting. 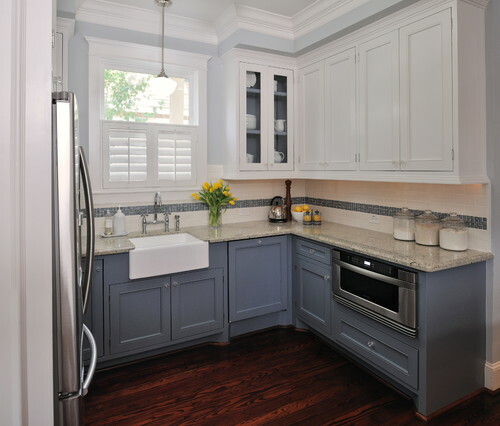 If new kitchen cabinetry is not a viable option, painting your existing cabinetry can make a huge a difference. Whether you choose a vibrant hue, a modern dark finish, or stick with relatively subdued colors like white or gray, covering up outdated wood and dingy colored cabinets of yesterday will make a world of difference. 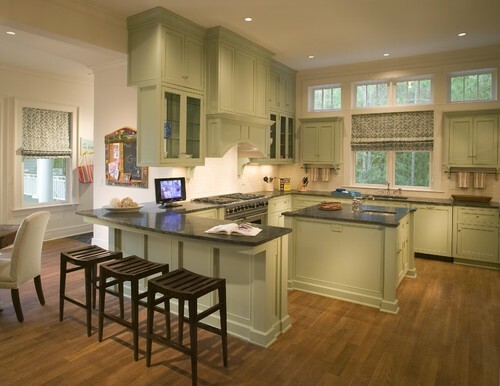 Walls filled with upper cabinets, especially in a small kitchen, can consume the eye and make the kitchen feel crowded. Consider removing some (or all) of them and adding open shelving to make the kitchen feel larger and more open. Countertops typically take up a large portion of real estate in most kitchens, so outdated surfaces (think tile-and-grout or cheap laminate) can really drag down the look of the entire space. Natural stone countertops are enduringly beautiful and will always stand the test of time. From marble to granite, to all the stones in between, such as limestone, soapstone, quartzite, there is something for everyone, and every budget. For most homeowners, the kitchen is the heart of the home and tends to be the gathering place for busy families with children or when entertaining friends while cooking. 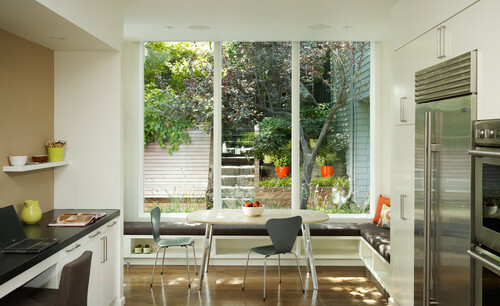 From bar stools to banquets to tables and chairs, seating has become essential in today’s modern kitchen. Many outdated kitchens feel boxed in and compartmentalized. Consider knocking out a non load-bearing wall (or two, or three!) to open up your kitchen to an adjacent dining room or living space. Lessen your carbon footprint and save money, too, by replacing your outdated appliances withe energy-efficient models. Look for appliances and plumbing fixtures with Energy Star and WaterSense labels. Saving water and energy are good for the earth– and for your utility bills. These are just a few of the cost-effective ways to change the look and feel of an outdated kitchen. We’d love to hear about some of your ideas in the comments! Todays kitchen is often the main hub of activity for a home, with many activities taking place there, often simultaneously. Whether cooking, eating, socializing or working, the kitchen needs to be as functional as it is beautiful. Regardless of your kitchen design style, it’s essential to have an efficient and functional layout. Here are some common mistakes to avoid when planning your new kitchen in order to achieve a practical, as well as aesthetically pleasing, kitchen design. One of the biggest design mistakes is not including enough storage. Almost every kitchen has wasted space, but this can be minimized with adequate planning and forethought. 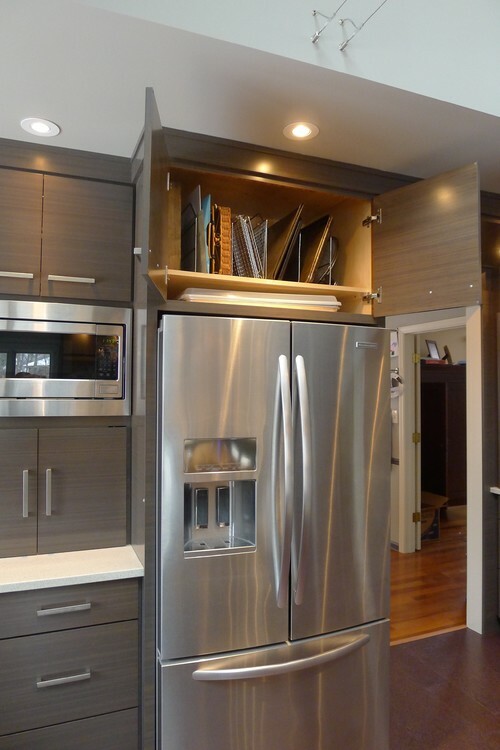 Consider installing extra-tall upper cabinets for extra storage space, and always install cabinets over the refrigerator; not utilizing this area is a real waste of space (this is a great place to store baking pans, racks and trays). If you are using modular or semi-custom cabinetry, you will likely have fillers between some cabinets. These areas offer the opportunity to add clever storage solutions such as these filler pullout organizers from Rev-a-Shelf. The kitchen is definitely one area that you can’t afford to have inadequate lighting. In the kitchen it is not just a matter oaf design and esthetics, it’s a matter of safety too. Most rooms generally need three types of lighting: general lighting for overall illumination, task lighting and accent lighting. 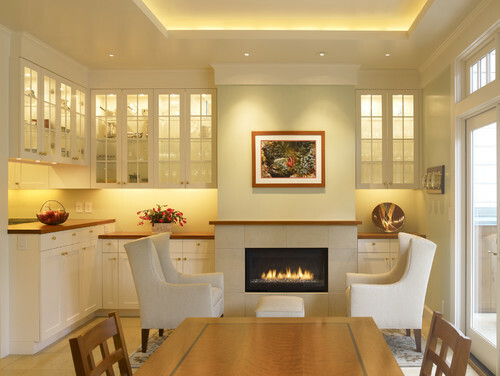 Evaluate the work areas of your kitchen and focus on providing each area with the light it needs. Consider adding lighting directly above all the main work areas. 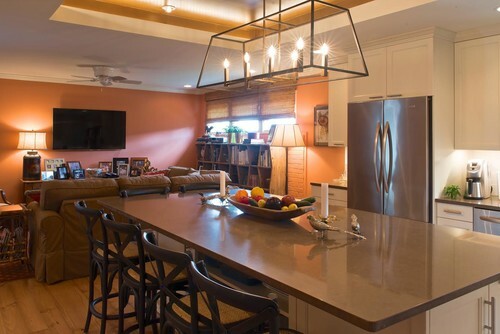 Use pendant lights to provide general lighting and enhance the overall look. Pendants look great above kitchen sinks, while a series of smaller pendants work well over breakfast bars and kitchen islands. 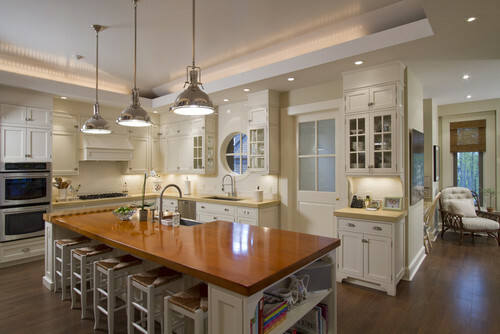 Install under-cabinet lighting to ensure that the counters have sufficient lighting for common kitchen tasks. If budget constraints are causing you to rethink the backsplash, think again – because omitting this feature will cost you a lot of time and effort in the long run. 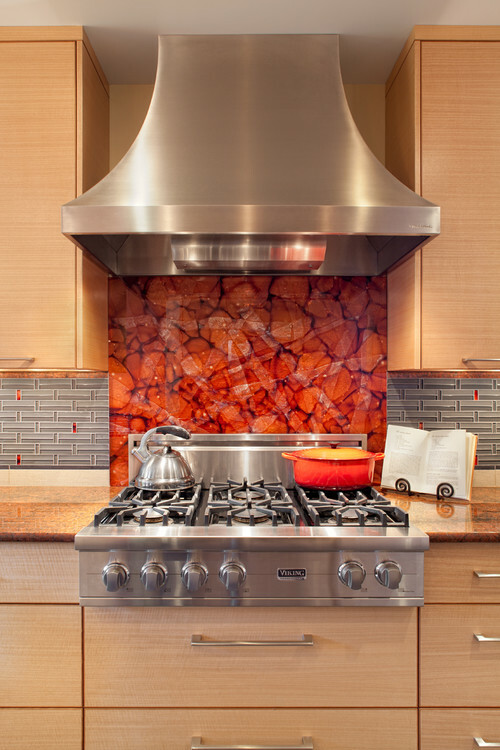 Water and steam can cause damage, and it’s much easier to clean grease off a backsplash made of stone, ceramic, metal or glass than paint or wallpaper. Inadequate counter space is one of the top kitchen design complaints. You’ll want to outfit your kitchen with as much open horizontal surface area as possible. Remember, there is no such thing as too much counter space! Adding an island, peninsula, or breakfast bar is a great way to increase countertop area. Smelling last night’s dinner is a sure sign of poor ventilation. Cheap range hoods just circulate dirty air, while higher grade equipment will improve the indoor air quality, keep your kitchen cleaner, and extend the life of your appliances. Avoid scrimping on your ventilation system – a good one will make your life easier and more pleasant, especially if you have an open kitchen plan. Designing your own kitchen renovation to save money is a common mistake that is often a costly one, wasting time and energy, to boot. Professional designers have the latest ideas and information to help you identify your needs and translate them into an efficient, aesthetically pleasing plan that will fit your taste and budget. Prestige Marble and Granite has the countertops you need to help make your new kitchen plan a success. We offer an exciting selection of designer natural stones, as well as a large variety of core colors, to complement any design project and any budget. We invite homeowners, designers, contractors, and builders to stop by our indoor showroom anytime; we’re here to help you every step of they way – from selection and layout through fabrication and installation.